With the Comark UTL882 Digital Pocket Timer with Clock you will always have accurate timing at your fingertips. The built in memory on the Comark Digital Pocket Timer will retain commonly used times and an audible buzzer lets you know when time is done. The Comark Digital Pocket Timer can be placed anywhere with an easel stand and magnetic back clip. 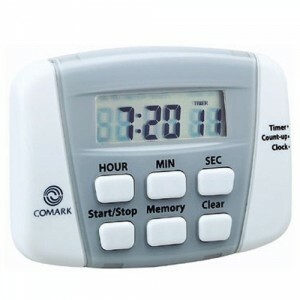 Easy to use the Comark UTL882 Digital Pocket Timer is great for any kitchen setting from home to professional.